YIDFF's 311 Documentary Film Archive collects, catalogs, preserves and provides access to documentary films and related materials about the Great East Japan Earthquake of March 11, 2011. 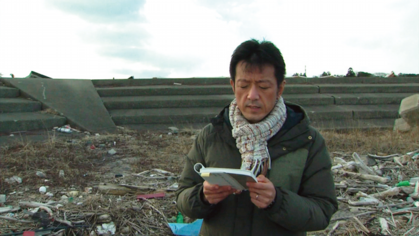 Fukushima-based poet Oikawa Shun'ya tries to compose contemporary noritos (Shinto ritual prayers), while tracing the history of the Tohoku region back to its ancient era when indigenous Emishi people lived in the area. What kind of words could possibly be effective for the recovery of 3.11 disaster-stricken areas today? This docuementary follows the poet's internal struggle. Hirata Junko has been working as a director in a television production company. After winning ATP New Comer Award in 2006, she directed "Pendant Eve" (2009). She won Matsukawa Award with "Nippon no kioku" (2010), JAAP Award 2012 with "Nanyadoyara - Songs for the Dead and Alive" and JAAP Award 2015 with "Shijin Enomono Sakurako no 'fuyu no tabi'". Copyright(C) Yamagata International Documentary Film Festival, All rights reserved.